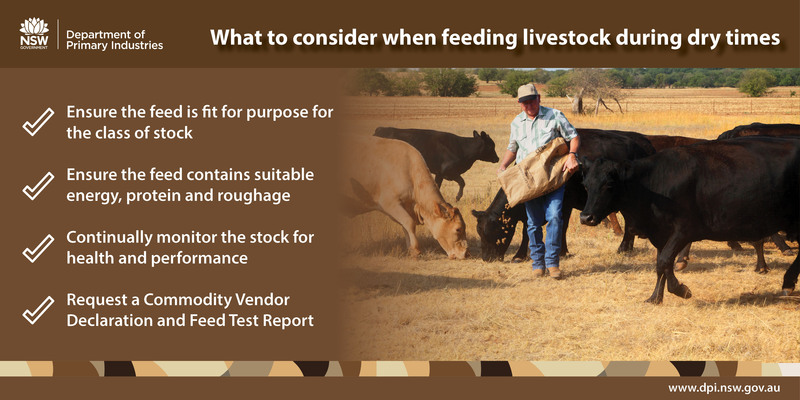 Choosing the wrong feedstuffs to supply livestock through the drought can do more harm than good, and producers are reminded to consider the specific needs of the stock they are feeding. NSW Department of Primary Industries (DPI) Beef Development Officer, Todd Andrews said the extremely dry conditions in many areas across the state and the onset of winter have reduced pastures, prompting many producers to look for alternative feedstuffs. “For producers who have identified a core mob of pregnant cows or other stock that need feed until spring, it is important to put together a ration that is suitable for the class of stock,” Mr Andrews said. Mr Andrews said the type of roughage available can have a bearing on feeding outcomes. “Digesting roughage is also important for stock to stay warm, in the event of cold wet weather,” he said. “Urea and other high protein supplements are only beneficial if good quality roughage is available. Energy generally becomes the limiting factor to animal growth as pasture quality and quantity decline. “While sources of suitable concentrate supplements such as white cottonseed and distillers dried grain have remained available, many producers are running out of roughage. “Extremely low quality roughages, such as rice straw, sorghum stubble and poor quality hay can result in pregnant cows losing up to half a kilogram a day, even when fed out with white cottonseed or grain. Mr Andrews said producers should request a feed test report from vendors, as this will indicate the type of performance that could be expected from animals eating it. “With drought forcing producers to increasingly demanding feedstuffs not normally provided to livestock, they should also ask vendors for Commodity Vendor Declarations to reduce food safety and market access risks from chemical residues in beef,” Mr Andrews said. “Other issues to be aware of during dry conditions is the potential for stock to lick batteries - especially where salt has developed around the terminals; eat poisonous plants such as rockfern or cestrum; or succumb to clostridial diseases due to rapid diet changes. Local Land Services, Senior Land Services Officer Livestock based at Mudgee, Brett Littler said conditions are ripe for major grass tetany problems in central and southern parts of the state. “This can occur when cows are put onto fodder crops to try to boost their nutrition around calving. It is imperative that producers supplement cows with magnesium to minimise this risk,” he said.